Back in the glory days of video games when it was all about Sega vs. Nintendo, speed became a deciding factor in which games were cool. Mario's great and all, but does he move as fast as Sonic? No, therefore Sonic is cooler. Now go finish your Hi-C alone in the corner. 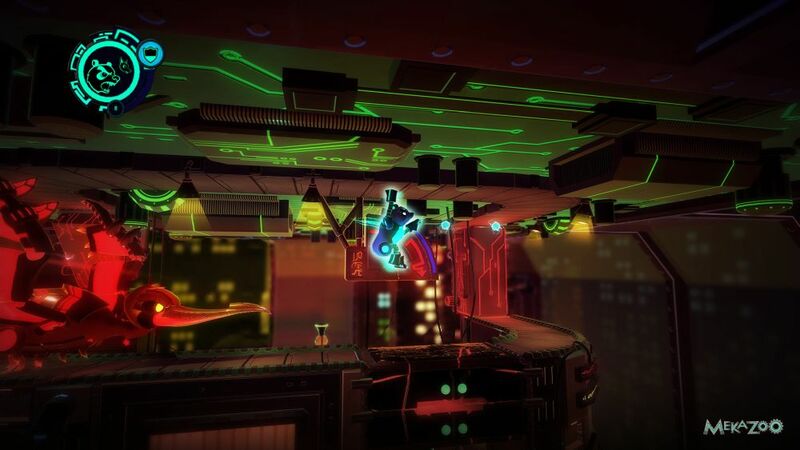 Mekazoo takes inspiration from speedy games of old (along with modern games like Rayman Legends) and shoves it all inside a glowing neon package, giving us the controlled chaos of speedrunning with an on-the-fly co-op mode that's guaranteed to start a fist fight. It all starts with a little armadillo waking from a mechanical slumber. Across the factory/lab, another animal is waking up, too. This one's red, so it's obviously a bad guy. Still, armadillo's gotta check that out, right? The story behind Mekazoo is pretty basic, all you need to know is that insects are gross and should be killed. Same goes for slugs. You'll control a Frog, Armadillo, Wallaby, Panda and Pelican as you blast through stage after stage of loops, ramps, bounces and futuristic cannons, all in the name of exploration and sweet sweet mekafreedom. Each mekanimal has its own special ability that helps you traverse the levels. The armadillo, for example, can roll up and dash, perfect for hitting half pipes and loops. The frog moves quite a bit slower, but he's got a tongue he can use to swing from bugs or nab blast cannons from a distance. You'll control pairs of these critters one at a time in each stage, swapping back and forth at the press of a button. The key to getting the most out of Mekazoo is learning when to switch and how to maximize each mekanimal's abilities. Levels are split into themed stages with a boss fight to cap things off. Bosses are a pretty interesting part of the Mekazoo experience. You'll defeat them by blasting parts of their bodies, dropping mines onto them, or otherwise manipulating the environment to cause damage. Basically, you keep on platformin', and eventually the big mekaboss will be toast. 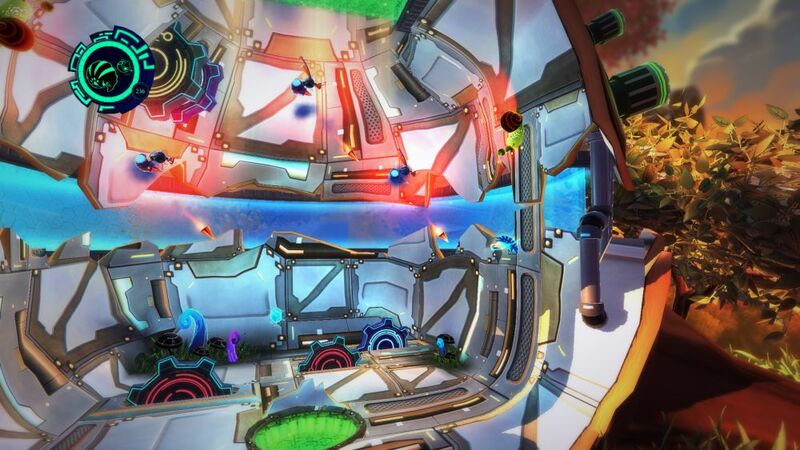 The core of Mekazoo's gameplay is built around fluidity. Speed is a key factor in this, but really it's a game of maintaining momentum. Levels have a number of challenges to complete, things like reaching the end in a certain amount of time, defeating all of the bugs, or collecting all of the gems. This collect-a-thon style feature can be frustrating in some games, but in Mekazoo it works in its favor. You can't get all of the challenges in one go, nor can you get them all by playing the exact same way. Time to replay some old stages as you aim for collectible perfection! 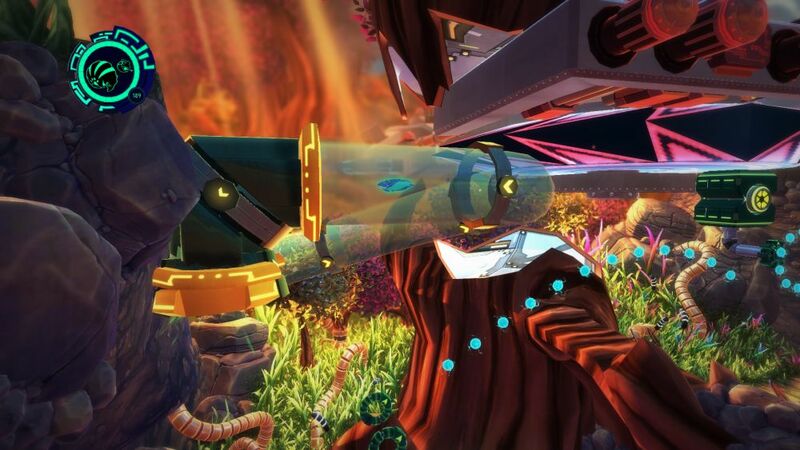 Developer Good Mood Creators describes Mekazoo's cooperative mode as "hive mind" co-op. The idea is pretty simple, as is the implementation, but the results are surprisingly entertaining. At any point in the game you can pause the action and add/drop the second local player. They'll take control of the non-active mekanimal as soon as you unpause. That's the catch, isn't it? If the mekanimal isn't active, what can player two do? They can take control with the press of the button, that's what. One smack and the hidden critter is front and center. Of course, player one can proceed to do exactly the same thing to steal the attention back, which is why you both have to stop fighting and actually work together if you want to get anything done. The hive mind idea takes off once you and your co-op buddy fall into the flow of the game. You both have to instinctively know which mekanimal is right for the upcoming section, often switching back and forth after only a few seconds of playtime. There's this strange sense of surrender both players will experience. You give up glory for the sake of progress, and you do it without even thinking. Of course, if you and your co-op pal don't slide into the hive mind mentality, things will get ugly, and fast. 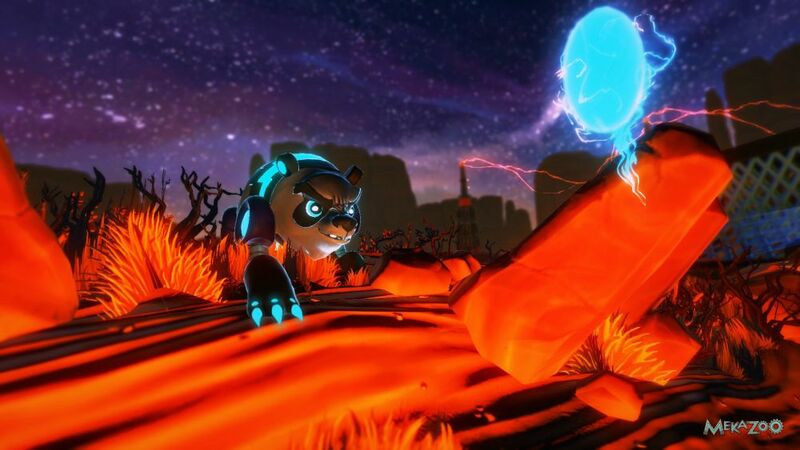 Mekazoo does an amazing job of stripping away unnecessary elements so you can focus on the game. There are only two buttons to worry about, one that lets you perform actions, and one that lets you switch characters. Every mekanimal's ability is tied to the action button, creating a seamless experience between hopping like a kangaroo or mlemming with the frog's tongue. Also, the game technically takes place on a nice and simple 2D plane, but there's so much panning and zooming and camera shifting going on you'll feel like you're nearly in 3D. 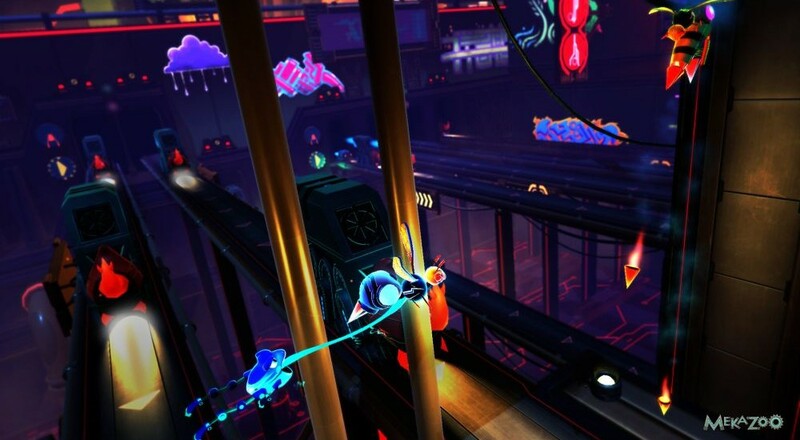 Everything about Mekazoo screams polish and attention to detail. The soundtrack? Oh, yes please. The graphics? Mmm, neon gears and futuristic plant life. Its focus on super fast gameplay might not be everyone's cup of mekacocoa, but if you're even a little curious about the game, you'll find it both accessible and tons of fun. The Co-Op Experience: Each player controls one mekanimal, switching between active ones to tackle different obstacles. Page created in 0.9772 seconds.